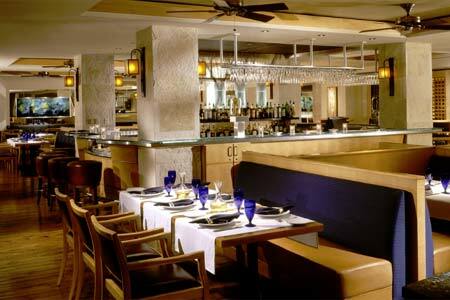 The raw bar dominates the dining room, tequilas are top-shelf, and seafood rules the waves. : Ostra’s Oyster Bar, featuring ceviche of Texas redfish, miniature tuna tacos with seaweed salad and, of course, bountiful bivalves, dominates the dining room at the River Walk level of the Mokara Hotel & Spa. The kitchen emphasizes Texas-sourced seafood such as said redfish and brown shrimp while also admitting cold-water halibut and scallops from New England --- with a coconut/peanut curry sauce, no less. Pescaphobes can opt for a massive rib-eye served with patatas bravas and an eight-ounce tenderloin massaged with a coffee-spice rub. Given the menu’s focus, the wine list seems red-heavy, especially in California Cabernets, but there are nevertheless plenty of whites at non-punishing prices for the traditionalist.